Donald Trump’s upset presidential victory this month has sparked a national debate over what it will take to improve the jobs and lives of America’s struggling working class. The Republican-led Congress is calling for rolling back government protections — like President Obama’s overtime pay raise — as the answer for unleashing businesses to create better paying jobs. 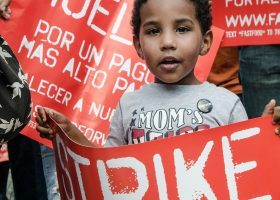 But the workers of the Fight for $15 — who are staging their largest strike yet on Tuesday — have shown the nation what would really move the needle for U.S. workers: $15 an hour and a union. 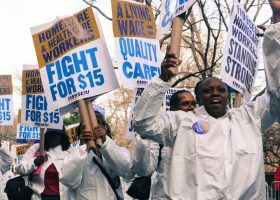 Since the Fight for $15 launched in 2012, when 200 fast-food workers walked off their jobs in New York City, underpaid workers have won a stunning $61.5 billion in raises, a report released Tuesday by the National Employment Law Project shows. 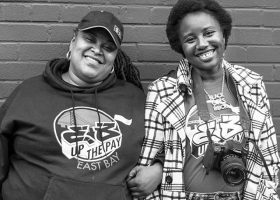 By compelling states, cities and private employers to boost pay, workers in the Fight for $15 put more money in the pockets of 19 million workers nationwide in the last four years. To put the scale of these raises in context, that’s more than 12 times larger than the $5 billion raise for 5 million workers that Congress delivered the last time it raised the federal minimum wage in 2007. More than $40 billion of the raises came via landmark $15 minimum wage increases passed in places like California, New York, Seattle and the District of Columbia. And 2.1 million of workers won raises this month when voters approved minimum wage ballot initiatives in Arizona, Colorado, Maine, Washington state and Flagstaff, Arizona. In the four states, “yes” votes exceeded the vote totals for either of the major parties’ presidential candidates — striking proof of the broad public support for raising wages across party lines and regions of the country. The Fight for $15’s impact towers over past congressional action because it has been propelled by what workers need — not what moderate compromise might allow. As a result, workers have been fighting for and winning much bigger raises for much more of the workforce than ever before. For example, in California and New York, more than one in three workers will receive raises of close to $4,000 a year. In Los Angeles, 21-year-old McDonald’s cashier Anggie Godoy is now paid $10.50 an hour, up from $8 when the Fight for $15 began. The additional money in her pocket has Anggie believing she can fulfill her dream of going to Stanford. 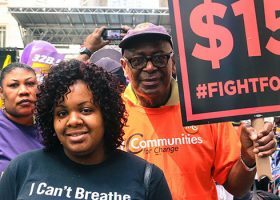 In New York, McDonald’s cook Jorel Ware, who got paid $7.25 an hour when the Fight for $15 began in 2012, will make $12 by year’s end and will no longer have to worry about his cell phone getting shut off. 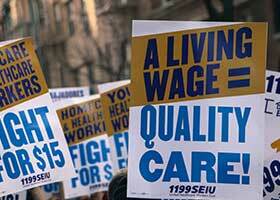 The raises sparked by the Fight for $15 are beginning to reverse decades of wage declines that have resulted in 43 percent of the workforce, or 60 million workers, earning less than $15 an hour. The rates are even higher in many swing states that Donald Trump carried: 45 percent in Michigan and Ohio and 50 percent in North Carolina. Across the U.S., median income rose 5.6 percent last year, the largest increase since at least the 1960s — a jump experts attribute in part to the Fight for $15. 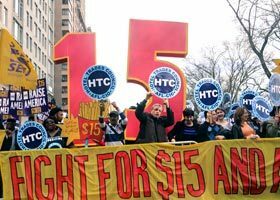 With momentum growing, more states and cities are pushing for raises of up to $15 an hour, potentially lifting wages for another 5 million or more workers in 2017 and 2018. But it will take Congress to give a raise to the whole nation — and especially the 21 states where pay is still frozen at the federal minimum wage of $7.25 an hour. With voters demanding action, the election saw more Republicans than before acknowledging the need for a higher minimum wage. Senators Rob Portman and Ron Johnson reversed their opposition and announced they would support some form of increase. Rep. Ileana Ros-Lehtinen of Florida became the first Republican in Congress to back a $15 minimum wage. And after declaring wages were “too high,” President-elect Donald Trump reversed his stance and called for an minimum wage increase to $10 an hour. 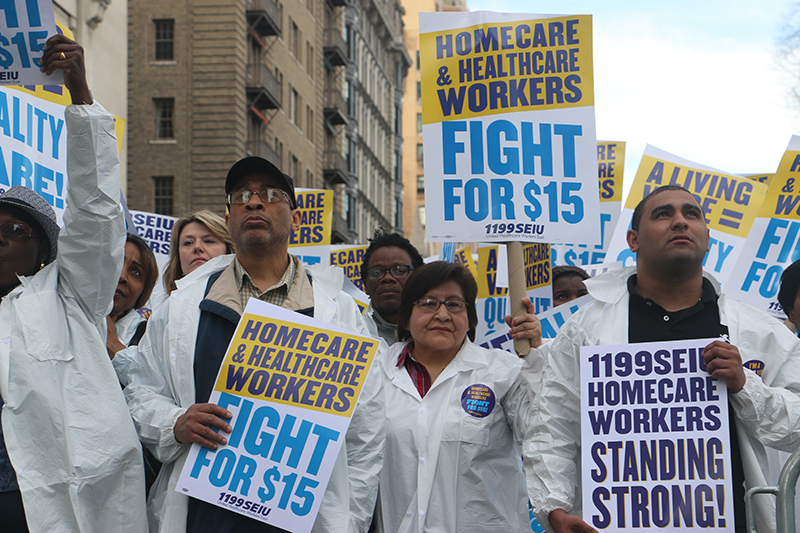 When brave McDonald’s, Wendy’s and Burger King workers in New York first walked off their jobs four years ago demanding $15 and a union, many thought they were crazy. Now, there’s ample evidence — $62 billion worth — that it was the doubters who were wrong. Paul Sonn is general counsel at the National Employment Law Project. Yannet Lathrop is a policy analyst at the National Employment Law Project. Read the original op-ed at PBS Newshour.